This morning, with constant horn honking and engine noise in the background, Council Member Jimmy Van Bramer called on DOT to study and implement traffic calming improvements along Thomson Avenue in the wake of the death of 16 year-old Tenzin Drudak, who was standing on the sidewalk when a driver jumped the curb and plowed into a group of pedestrians on Monday. Van Bramer was joined by students from LaGuardia Community College, area high school students, Community Board 2 Chair Joseph Conley, and Transportation Alternatives. “We cannot risk our lives to come into school any more. 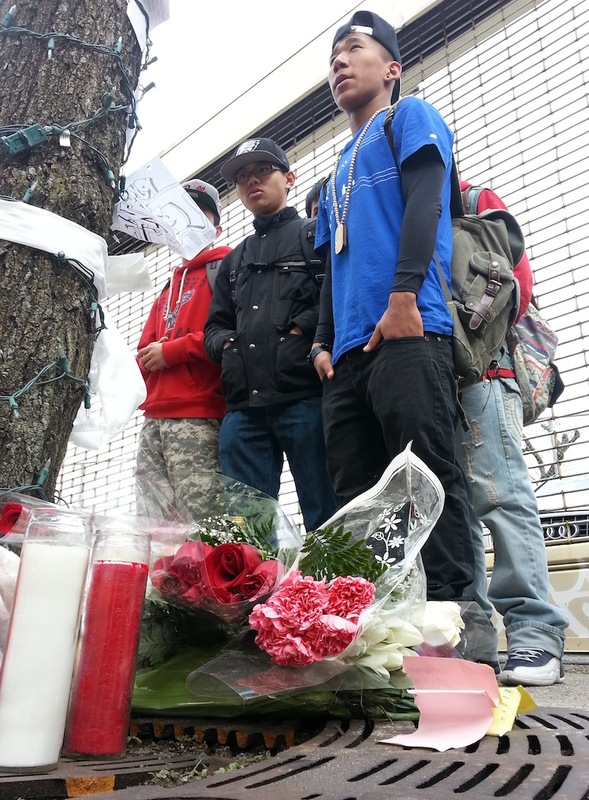 Please do something,” said LaGuardia Community College student government president Shah Amanat. Last July, nearly 500 LaGuardia students signed a petition asking DOT for more signal time to get across the street. In November, DOT replied, saying that the signals were functioning properly and that it would not adjust them. “We should never, ever, ever in this city sacrifice lives or put lives at risk in order to move cars faster. That is wrong,” added Van Bramer, who called on DOT to immediately study Thomson Avenue from Van Dam Street to Skillman Avenue for traffic calming, signal retiming, and additional bollards. In the last few years, DOT has added safety improvements to other bridge approaches, including Delancey Street near the Williamsburg Bridge, on the Brooklyn side of the Manhattan Bridge, and nearby, at Queensboro Plaza and along Queens Boulevard — but not on Thomson. DOT said it is in the process of evaluating curb extensions at the intersection where Drudak was killed. “The agency was already working with LaGuardia Community College to improve pedestrian safety and access at this location as part of the college’s planned expansion,” said spokesperson Scott Gastel. Streetsblog asked DOT if the agency has a timeline for implementing traffic calming measures but has not received a reply. The driver that killed Drudak has been identified by police as Mohamed Keita, 36, of Charlotte, N.C. He was issued a summons for driving without insurance. Although witnesses said Keita was speeding and the driver himself reportedly attributes the crash to being distracted by spilt milk, no charges have been filed. “There could be a better job of enforcement,” Conley told Streetsblog after the event. Although he said the 108th Precinct works well with the community, he added that red light running and dangerous driving is a continual problem. Last year, the precinct issued 504 summonses for failing to stop at a traffic signal and 296 speeding tickets. Van Bramer has been a champion of speed cameras, which have a shot at passing in Albany this year. The City Council’s transportation committee will be holding a public hearing on Van Bramer’s resolution asking Albany to take action on Monday at 2:30 p.m. Since it seems we can’t depend upon drivers to stay in the streets, we should require sidewalk bollards along every heavily used sidewalk to keep things like this from ever happening again. Also, it’s incredible the police aren’t filing any charges. Are cars legally allowed to drive on sidewalks in NYC? If not, that alone is among the charges which should be filed. Joe, this street does have bollards up and down the length, just not at the crosswalks. Perhaps that is where they are needed most. No insurance, speeding, and distracted. Guess we’re up to the “Rule of Four” now. It’s high time that when a motorist kills someone, there is a presumption they were speeding at a rate commensurate with depraved indifference to human life. The driver could, at their expense, have the actual speed at time of impact (plus state of braking, ABS, etc.) read from the vehicle’s black box by a bonded agent of some sort, proving what their actual speed was. Motorists driving vehicles without a black box would have to hire a team to do a Wreck Reconstruction to determine speed. Or if they are lucky, their pre-impact speed would be logged by a speed camera. I also have a hard time understanding why black box data isn’t used in crash reconstruction. This data is routinely pulled whenever a plane or train crashes. Why should it be any different in a motor vehicle crash? There is no expectation of privacy when you’re operating on public roads. Yeah. I can’t believe that he’s got away with a ticket only. Thanks NYPD, you’re doing such an awesome job protecting NYC…. drivers.